Today, John Walsh published an excellent "tutorial" on how to identify pitches based on PITCHf/x (Enhanced Gameday) data. That's really nice on its own. But on top of that, he published figures showing vertical and horizontal break of pitches for 150 pitchers! I thought I'd use this opportunity to take a look at Reds pitchers featured among those 150. First, for those who haven't been following the Gameday Craze, here's a primer: MLB.com's Enhanced Gameday gamecast software includes detailed physical pitch tracking information about pitches thrown in stadiums that have the PITCHf/x camera system installed. These data can be extracted from the xml files that power Gameday. We can then use them to do all kinds of amazing studies that we've never been able to do before (I picked out some highlights earlier this season, and Mike Fast has a complete catalog of this year's work at his site). These data really are starting to blur the lines between scouting and more traditional statistical analysis, which is really exciting. Fastballs don't fall much and are thrown hard. They also have horizontal movement, usually to the left for right-handed pitchers and to the right for left-handed pitchers. Changeups are 10-15 mph slower than fastballs, and don't fall much beyond what is expected due to gravity (they're slower pitches, so they look like they fall more when we watch them, but it's just because gravity has more time to work rather than spin-based physics). Curveballs have negative vertical break, and tend to have horizontal break in the opposite direction to a fastball. Sliders are somewhere between curveballs and fastballs, both in terms of speed and vertical break. Some "sliders" appear to have zero break at all compared to a theoretical pitch without spin. This is exciting to me because I am hopeless when it comes to "scouting" pitchers on anything but location (I can watch where a ball goes compared to where the catchers' mit was targeting to get an idea of that...but even then, I'm not very reliable). With the exception of exaggerated curveballs like Arroyo's, I can't tell one pitch from another. This means I have very little knowledge of the kind of pitches that Reds hurlers actually throw, except what I hear from Mr. Brantley on radio broadcasts. These kind of data allow me to start to bridge that gap. Furthermore, they allow us to actually conduct quantitative analysis of pitch types...might eventually allow us to measure quantitative differences pitchers when they are effective and not effective, for example. Cool, huh? I want to talk about Harang first because he's a little more straightforward. With Harang, we basically see two primary pitch types. First, in the upper-left, is his fastball, which, based on an eyeball comparison to other pitchers, looks to me to have slightly above-average variation in its horizontal break. It can come essentially straight in, or it can have as much as ten inches of horizontal break (or "cut") in on the hands of right-handed hitters. These pitches vary from 85-95 mph, and I don't see any particular clustering of different pitch speeds to tell a straight fastball from a cutter here. It looks like there are just different variations on a fastball. We also see Harang's hard slider. It seems to follow a trajectory similar to that expected from a ball without any spin at all, with only a slight vertical rise and slight horizontal break. That gyroball-esque movement pattern is something that Walsh noted is fairly common in his description of a sliders. It likely looks like it's breaking because a) it's slower and thus will have more vertical drop due to gravity than a fastball, and b) most fastballs move so much to the left that "straight" pitches seem to move quite a bit. Harang's slider typically clocks in at 80-85 mph, though can hit 85-90. There may be a third pitch visible here as well--a slightly slower breaking pitch that has less "rise" than the hard slider and perhaps an inch or so more horizontal break. It might be called a curve, or just a variation on his slider. But it's a slower breaking pitch than the harder slider. So, at least from the perspective of what the pitches actually do, Harang is a 3 pitch hurler who generally throws most stuff fairly hard. What this doesn't show, of course, is Harang's outstanding control, which is a big part of how he can be so successful with a relatively small arsenal of pitch types and speeds. 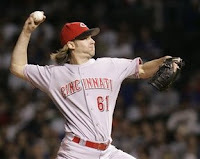 Arroyo is sort of a "slop" pitcher, in that he throws many different pitches from all kinds of different arm angles. Arm angle isn't necessarily depicted in this figure unless it causes vastly different movement (as opposed to location). But I think it is notable that the upper-right cluster of pitches has a larger spread than that of Harang in terms of vertical and horizontal break, as well as speed. Nevertheless, there are three basic types of pitches that I can make out from this figure. The first is his fastball, which makes up the pink and dark green pitches in the upper-left cluster. Generally, while the overlap of datapoints makes it slightly hard to judge, it seems like the majority of Arroyo's fastballs come in at under 90 mph, which is consistent with my observations of him. Like Harang, he also seems to show a lot of variation in the extent to which his fastballs move horizontally in or away from a batter--slightly more than most pitchers I see in Walsh's article, at least, based eyeballing the data a bit. We also see Arroyo's change-up (though I guess it could be a splitter, as it does have a slightly more negative vertical break than the fastball), which likely accounts for the red and orange pitches in the upper-left cluster. With those orange dots coming in at 70-80 mph, and his fastball topping out in the low 90's, we can see that Arroyo may sometimes get roughly a 15-20 mph difference between his fastball and his change. And because it largely overlaps with the fastball in its movement, it may be difficult to distinguish over the first few fractions of the second as it heads toward the plate. Finally, in the lower-right, we see what is probably Arroyo's best pitch: his curveball. This pitch is coming in consistently 20+ mph slower than his fastball, which in addition to messing up a hitters' timing, will result in substantial apparent vertical break as gravity does it work, despite not having much additional vertical break due to spin. But what makes it so tough (and easy to see as a fan) is that it also has a huge horizontal break, moving as much as ~15 inches from left to right from the perspective of the catcher. This movement away from the right-hander is probably what allows Arroyo to be so effective against them (0.696 OPS vs. righties career, vs. 0.815 OPS vs. lefties career), as it can start on the inside corner and move all the way to the outside corner of the 17" plate -- or, if it starts down the middle, it will end up well off the outside corner. Assuming, of course, that he can locate it. So that's what I can get from these data. I'm curious to hear from those of you who actually know something about pitching and identifying pitch types by sight. How does this match up to what you've seen from these guys? 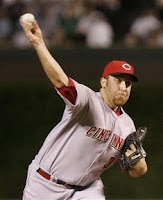 Does Aaron Harang have two discrete breaking pitches, or are we seeing incremental variations on his slider? How deceptive is Arroyo's change-up when compared to his fastball? I'd love to hear from you. Also, at some point, I do plan to try my own hand at working with these PITCHf/x data. Maybe then we can find out about some of our other pitchers. Thanks for posting this. I couldn't get the page to work last night. I have some stuff on Arroyo pitches, using k-means cluster analysis, that you may want to check out. That's interesting. I haven't been following the pitchf/x research that closely, though I'm familiar with cluster analysis and ordination methods in other contexts (mostly examining biological systems or traits on individuals). Does the finding that 5 clusters are necessary to explain the majority of variance indicate that he may have five pitch types? I think it's interesting that (if I'm reading this correctly) you're identifying two types of curve balls, and perhaps two types of fast balls. Release points on the two curve balls, in particular, vary quite a bit, which might be a reflection of those times when Arroyo drops down to deliver that pitch...? The Reds just recently had the stuff installed to allow this data to be seen while playing in GABP. So expect to see a lot more of this type of stuff next year, instead of just the road type of stuff that we have for this years Reds. So expect to see a lot more of this type of stuff next year, instead of just the road type of stuff that we have for this years Reds. Yeah, some of it might be stuff that I generate! :) Glad to hear that the data are now coming in. Nice writeup. I did not try to select "interesting" pitchers, but rather just took the top 150 or so ranked by number of pitches thrown. Only Arroyo and Harang made the cut. I did this just to limit the size of the pdf files. email me if you'd like more for Reds pitchers.